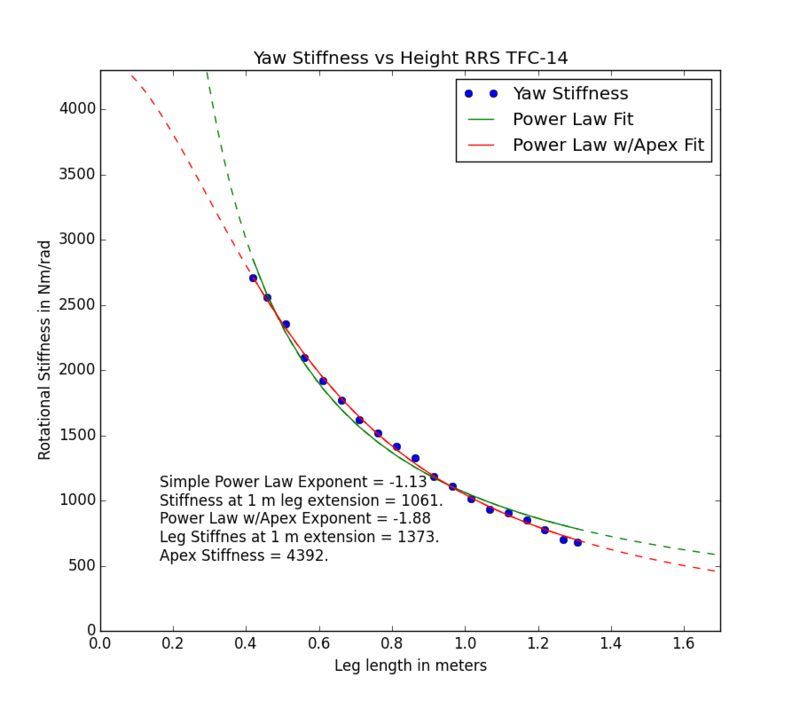 In the first post in this series of stiffness vs height measurements, I laid out the motivation for doing this set of measurements and introduced the models I was going to be using to fit the data. Briefly, I want data to help understand tripod structure in the context of beam deflection, and to provide data to create a score metric that properly accounts for height differences between tripods. In the second post, I looked at the three different Manfrotto MT055 tripods, and found that they performed in a matter consistent with each other. Here, I present the stiffness vs height data for six more tripods and discuss the implications at the end. Without further adieu, here is the stiffness vs height data for the Gitzo GT2542 Mountaineer tripod. The GT2542 is a four section tripod, so I expected the magnitude of the exponents to larger than for three section tripods. Quite the opposite here. The exponents are lower in magnitude than we saw for the Manfrottos. My best guest for this is that Gitzo’s new “Exact Carbon Fiber” legs use a thicker diameter bottom leg section compared to the upper sections. This will make the stiffness of the leg more uniform throughout, and lower the magnitude of the exponent. Again we can see the model with an added finite stiffness term performs better, but it is a little less dramatic than with the Manfrottos. The Oben was quite a surprise. I specifically chose this tripod as it has a very weak center column locking mechanism. With the twist lock fully tightened down, one can still rotate the center column by using a little leverage. 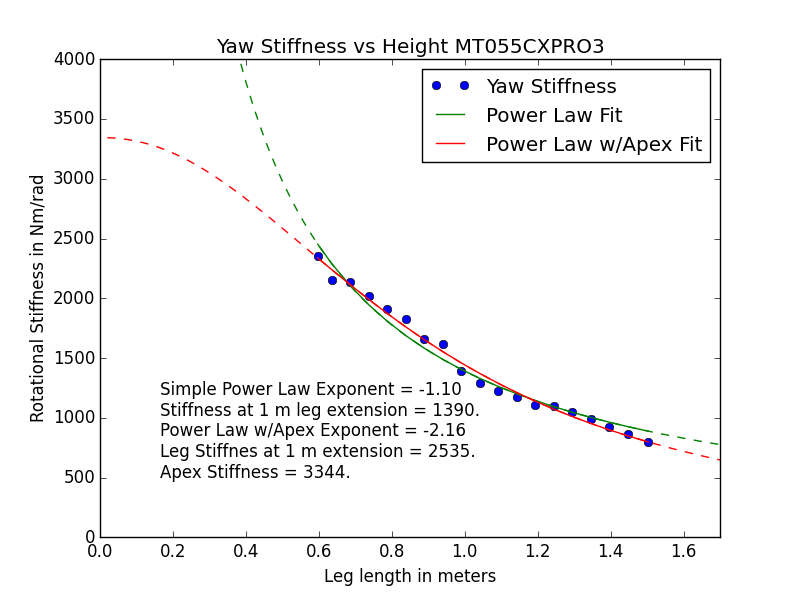 I thus expected the apex stiffness to be low, which is clearly not the case. So, either my impressions of what constitutes a stiff apex are wrong, or the constant stiffness term isn’t actually reflective of the apex stiffness. The answer is probably a little of both, but I don’t know. 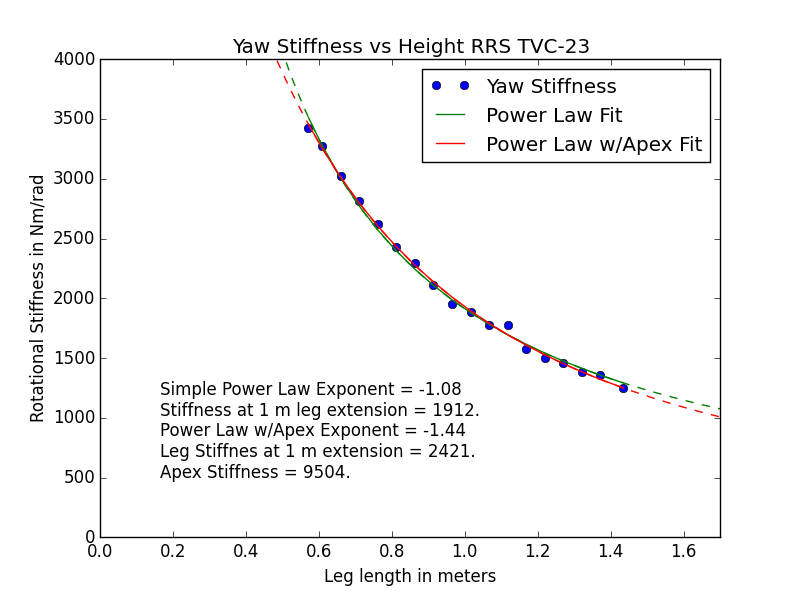 If the legs don’t behave according to a simple power law, any error in that assumption will show up in that constant stiffness term as I currently have things set up. Assuming that it is reflective of the apex stiffness, the good news and bad news for the Oben is that most of the flexibility comes from the legs. But those legs are not particularly stiff. Also, note how close the two fits are to each other despite having a different exponent. There is a lot of error fitting this type of data, so take the fitted parameters with a big grain of salt. These are useful for ballpark estimates, not nitpicking over small differences between tripods. Technically speaking, there is a significant amount of covariance amongst the fit parameters. This is in contrast to fitting the frequency in the individual stiffness tests, where the fitted frequency is very accurate and not related to the other fit parameters. I chose to test this tripod, as it was the only five section tripod I had on hand, and would thus provide the greatest range of heights. The results are less interesting that I had hoped, with one of the flattest curves I had seen among the data. The tripod is simply not very stiff all around, and it shows. This tripod had one of the biggest disparities between the power law fit for the two models, which makes sense given it has the lowest apex stiffness of any tripod I tested. 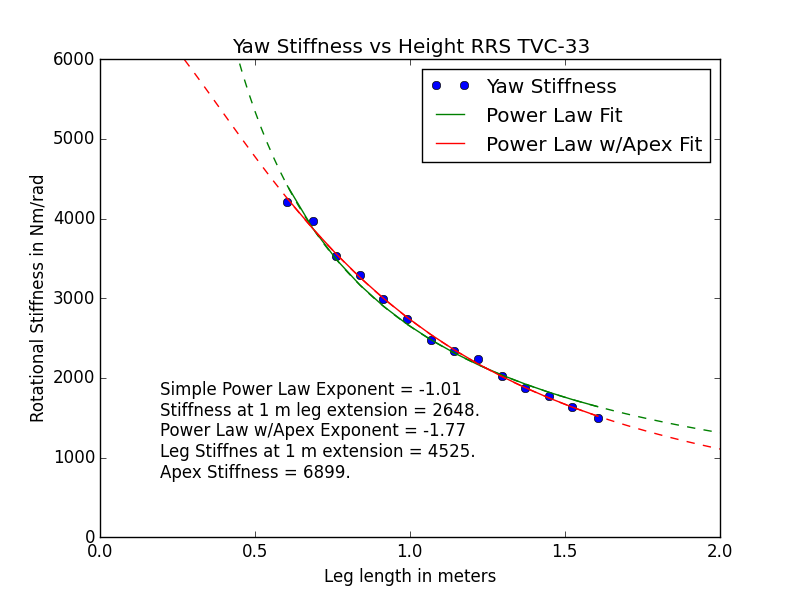 I chose the RRS TVC-33 hoping that it would show a nearly infinite apex stiffness due to having no center column. Definitely not the case. 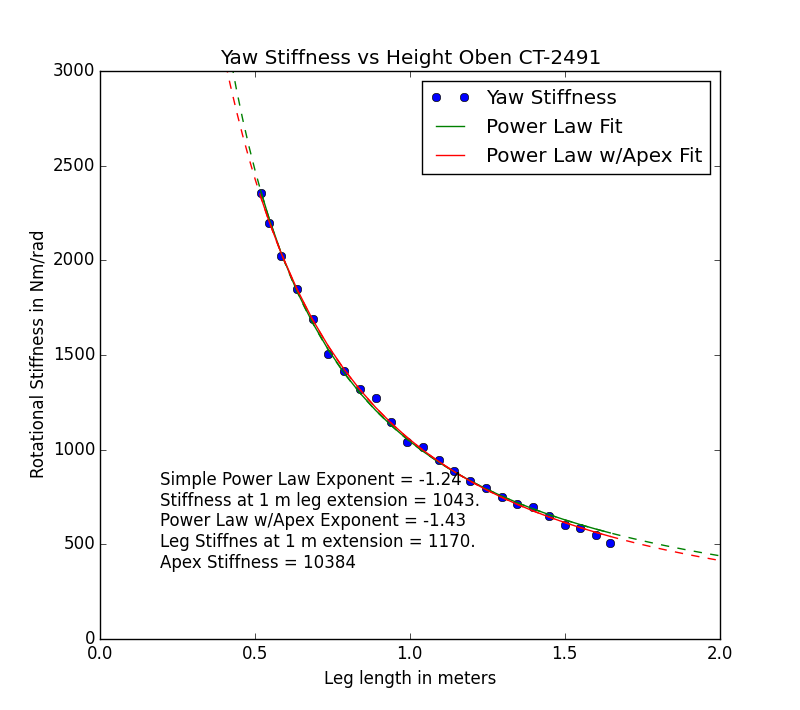 This is the best evidence I have yet that the constant stiffness term may not actually the apex stiffness, but more complicated aspects of the stiffness in the legs as well. Clearly the constant stiffness term is necessary to accurately describe the data in this case. The TFC-14 shows a lower apex stiffness than I expected given that the apex is just a chunk of aluminum. It could be that the coupling between the apex and the camera bar I use for testing wasn’t great due to the very small size of the TFC-14 apex. 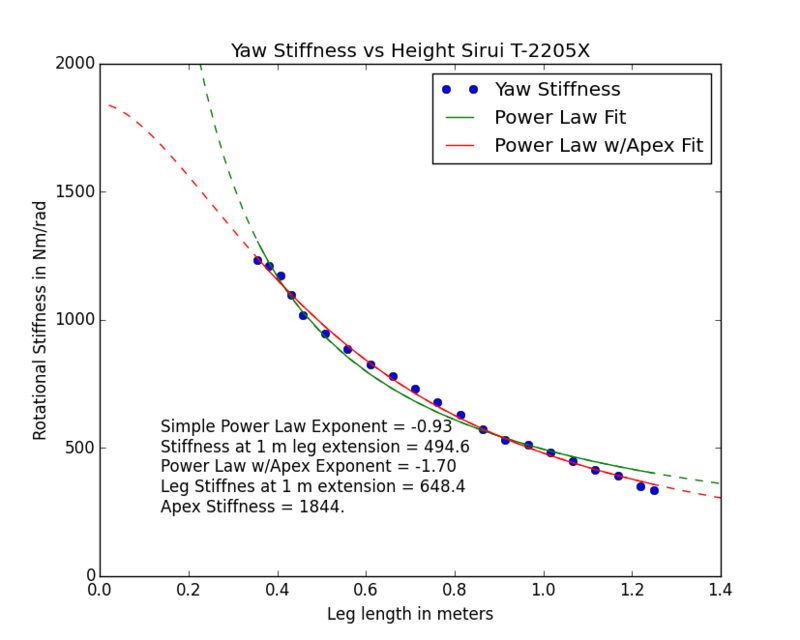 Again, it could also be that the ‘apex stiffness’ term is actually just capturing some complex aspect of the leg behavior. One of the main motivations of this work was to find a simple way to compensate height when comparing the stiffness of tripods. Because I am not going run a stiffness vs height test for every tripod, I won’t have the constant offset ‘apex stiffness’ term. Looking at only the simple power law fits, we can see that an exponent of -1 is a pretty reasonable and simple guess for the power law behavior. Obviously it is far from perfect and suits some tripods much better than others. It represents the TVC-23 very well, and other tripods to varying degree. In terms of modeling tripod behavior, this data set also places an upper limit on the magnitude of the exponent. The exponents measured here are coming in significantly lower in magnitude than -2. The lower sections of tripod legs are less stiff than the upper ones, so we should expect the magnitude of the exponent to be higher than for a simple constant stiffness leg. These factors lead me to believe that the correct exponent for a constant stiffness leg is -1. This follows the stiffness behavior we would expect from a cantilevered beam with an end moment, which also happens to look like a reasonable model.